For someone who's no longer in business with NBC, Donald Trump sure is spending a lot of time on the network. The GOP presidential candidate will host the Nov. 7 episode of Saturday Night Live, NBC announced today. "Look forward to it," Trump tweeted. He previously hosted the show 11 years ago, on April 3, 2004. The news comes four months after NBC cut professional ties with Trump following his controversial comments on immigration during a June 16 speech announcing his presidential run. "At NBC, respect and dignity for all people are cornerstones of our values. Due to the recent derogatory statements by Donald Trump regarding immigrants, NBCUniversal is ending its business relationship with Mr. Trump," the network said at the time. The network dropped his annual Miss USA and Miss Universe pageants, which were a joint venture between NBC and Trump (Reelz aired Miss USA instead, and Trump later bought back NBC's share), and replaced Trump as host of Celebrity Apprentice with Arnold Schwarzenegger. In August, NBC Entertainment chairman Robert Greenblatt told reporters that while Trump would "absolutely not" return as host of Celebrity Apprentice, he wasn't barred from appearing on the network. "I don't think somebody who is running for president and might possibly be the next leader of the free world will be completely banned from any activities at NBC," Greenblatt said. Indeed, Trump was soon booked for The Tonight Show on Sept. 11, his first appearance on the show since his split with the network. During the episode, he interviewed "himself" during a mirror sketch with Jimmy Fallon. Saturday Night Live devoted the "cold open" of its Oct. 4 season premiere to Trump, as he (Taran Killam) and wife Melania (Cecily Strong) attempted to clear up misconceptions about his feelings about women and immigrants. 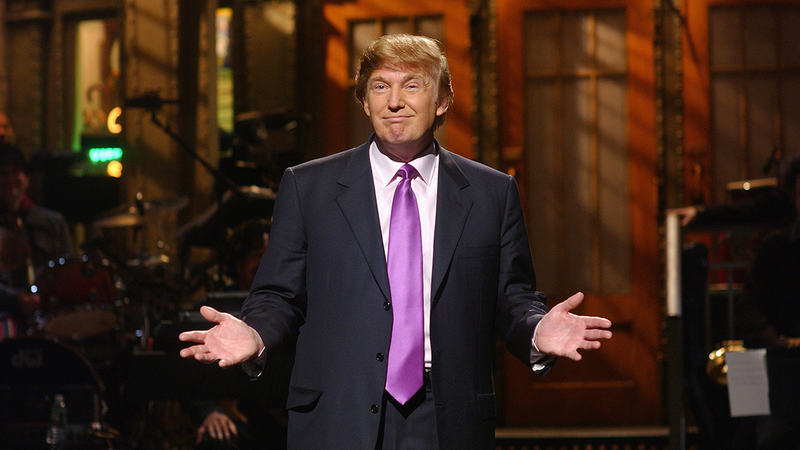 Trump won't be the first presidential candidate to appear on SNL this season. Hillary Clinton made a cameo on the Oct. 4 show, playing a bartender, Val, who chatted up the faux Clinton, played by Kate McKinnon. When Trump hosted in 2004, his was joined during his opening monologue by his SNL Doppelganger, Darrell Hammond, as well as Jimmy Fallon, who played then-NBC president Jeff Zucker.